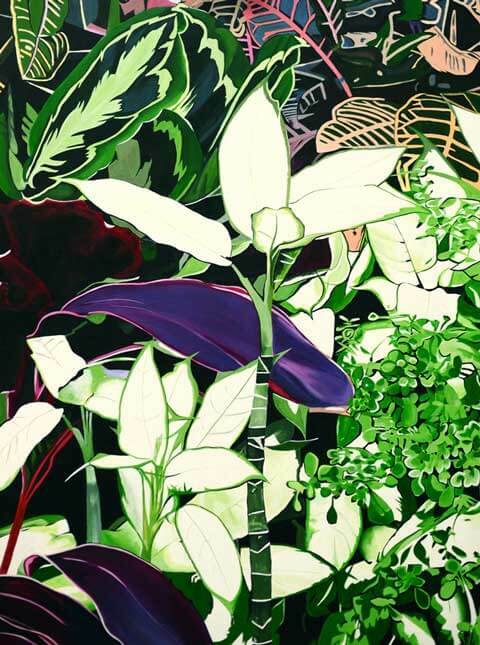 Painted in 2012 for the artist’s first solo exhibition at Northart Gallery, Wintergarden 1 is one of three paintings inspired by the Auckland Domain Wintergardens. It is a macro, stylised view of a cluster of hothouse plants and tropical plants. The white leaves appear almost like flowers, and the range of foliage colours are punctuated at the centre of painting by the purple leaf. Acrylic on canvas, 2012.